Daniel appears to O'Neill and warns that Anubis is en route to Abydos to find the Eye of Ra, an ancient relic of enormous power. As an ascended being, Daniel is forbidden to interfere, and he urges SG-1 to find the Eye and stop Anubis. SG-1 arrives on Abydos, where they are reunited with Skaara, and they prepare to defend the planet and find the Eye of Ra hidden within the pyramid. Daniel reappears and assists in finding a secret chamber which contains an ancient tablet. It reveals that the Ancients were once humans who learned to ascend, and that the legacy of the ascended Others of their race lives on in an ancient Lost City. SG-1 recovers the Eye of Ra as the forces of Anubis arrive and overwhelm the Abydonians. 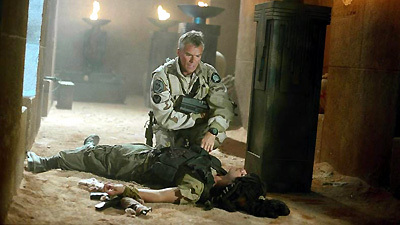 In the battle for Abydos, Skaara is wounded and ascends, and SG-1 is trapped within the pyramid as O'Neill attempts to negotiate their freedom by threatening to destroy the Eye. Meanwhile, Daniel learns that Anubis is a Goa'uld who has become trapped between existence and ascension. Daniel summons the collective forces of the System Lords, and offers to bring Anubis the Eye in exchange for sparing Abydos. However, when he persuades O'Neill to turn over the Eye, Anubis uses its unimagined power to drive the System Lords into retreat. Anubis turns his destructive power on Abydos. Daniel risks the wrath of the Others by facing Anubis in battle, however, a higher power draws him away. SG-1 escapes through the gate with the Ancient tablet, but they sense the massive energy behind them as Abydos is destroyed. When at last a wormhole to Abydos can be established, SG-1 steps through to find the planet intact, and Skaara and his people alive. However, Skaara explains that what they see is not real. The Abydonians have all ascended through the power of Oma Desala, and their lives will continue on another plane as SG-1 departs Abydos for the last time. The Others are the Ancients. The Ancients evolved from a race of humans that lived long before us. They were wiped out by a plague that was sweeping across the galaxy. Many learned to ascend, and the rest died out. The Lost City of the Ancients holds powerful Ancient weapons. The Goa’uld that Anubis used to be figured out how to ascend. The Others didn’t want him, and tried to send him back, but they could not send him back all the way. He’s still a form of energy. The black mask is a shield that’s keeping his form intact. He’s stuck somewhere between human existence and ascension. Oma is an outcast among the Others because she believes that helping people ascend is her duty. Those who follow her are walking a very fine line. If Daniel were to take action to change human existence, Oma would step in and stop him herself to avoid drawing the wrath of the Others. According to legend, there were six Eyes, including those held by Apophis, Osiris, and Tiamat, among others. Each is powerful on its own, but if you use them in combination, it increases that power tenfold. Anubis acquired five of the six Eyes and obtained the Eye of Ra from Abydos. Yu now commands the collective forces of the System Lords, rallied against Anubis. His fleet is destroyed and retreats. Jonas is able to translate the Goa’uld writings on the walls of the pyramid, and the early dialect of the Ancients on the tablet.